Fuseco offers wide range of spectrum analysers from GW Instek. 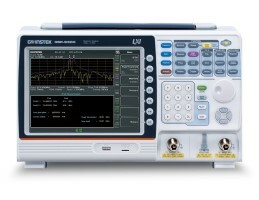 GW Instek spectrum analyzer lineup fits a broad range of applications in research and design, service and maintenance, manufacturing, educational and other related fields for the frequency range from 1GHz to 3GHz. There are many features are designed to perform higher stability measurement, further signal analysis and more efficient measurement. The 0.025ppm frequency stability over temperature is employed, integrating with high efficient heat dissipation mechanism, to sustain the stable and accurate measurement. The topographic and spectrogram display modes are developed to paraphrase the signal in color temperature pattern to perform the signal persistence and time progress. The SEM, ACPR, OCBW, CNR, CTB, CSO measurements, 1Hz marker frequency counter and many other measurement functions are provided as well. The sequence function allows to create and perform a series of measurement steps without connecting to PC. The most common interfaces including LXI are included designs for remote control. GW Instek provides the most cost-effective options in RF measurement.